Barbara Brown Taylor – Amy Lyles Wilson, M.A., M.T.S. 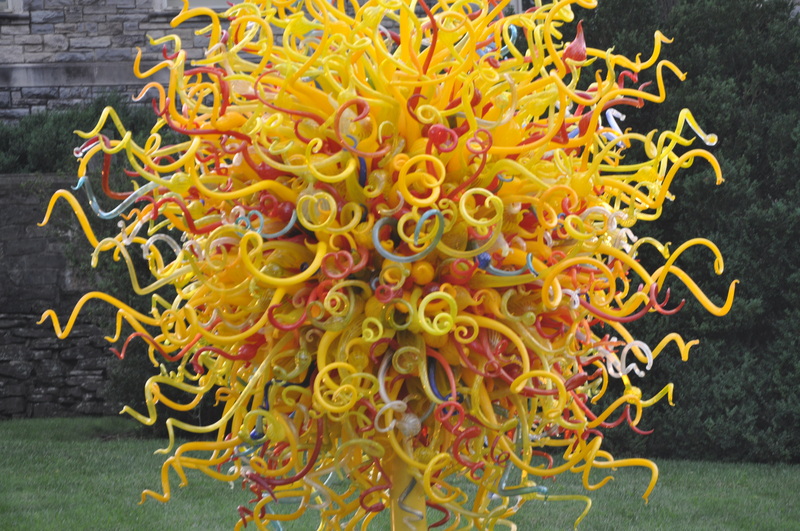 I saw this fabulous Chihuly sculpture several years ago at the Cheekwood Botanical Garden and Museum of Art in Nashville. During Holy Week I heard a lot about being in the dark. From speakers, priests, books I’m reading. Dark, dark, dark. Barbara Brown Taylor spoke about how she thinks some folks spend too much time focused on “full solar spirituality,” neglecting entirely the darker side. A priest noted that she learned things about herself, and her God, while struggling through a rough time in her life. Much of what I’m reading now focuses on Buddhist and Celtic practices, which reminds me that I have to go through the desert in order to experience and appreciate renewal. I wonder about people who refuse to acknowledge the death and destruction in the Bible. In our lives. I believe in the power of positive thinking–and prayer–as much as the next gal, but life is hard, people. Denying that reality does not equal faith. Always seeing the glass as half-full does not make you a more steadfast believer. It might make you less able, in fact, to deal with the half-empty days. And there will be such days. Sometimes I see dark when things are simply murky, though, and that’s a problem. I worry that I’m more comfortable wandering through the night than embracing the bright scrutiny of day. I’m working on it. But I’m not afraid, not on any cosmic level, to sit with people who are grieving or hurting or scared. Maybe it’s easier to companion others than it is to befriend my own soul. What is that about? I respect the darkness, and value what it has to teach me. But today I choose the light, trusting full well there are lessons there, too.